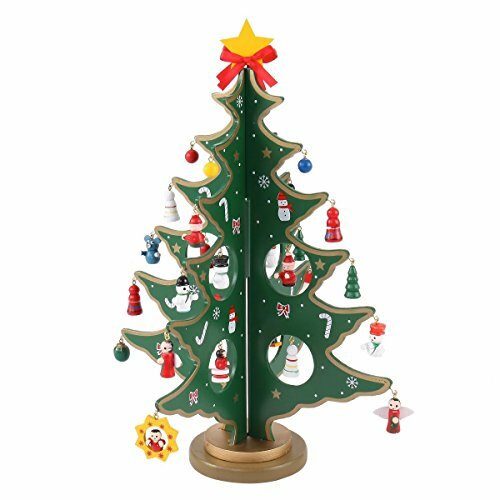 Products include:A 12Inch Wooden Christmas Tree and 20 Mini Ornaments. The Products with some Mini Ornaments.Please keep these Mini Ornaments away from your baby's mouth,the Ornaments can choke your baby,adult supervision required. ☆It's a very interesting Christmas desktop decor. You can put it on your desk, dining table or your children's room. The suitable size can be used to decorate a lot of places. ☆Made in natural wood,light weight, and it's more durable than plastic. ☆Fast and easy assembling without using tools.It's very funny for your kids, strengthen your child's operational ability. ☆Warmth warning:Keep these Mini Ornaments away from your baby's mouth,the Ornaments can choke your baby,adult supervision required. ☆Size:12Inch*3Inch. Very convenient to carry. If you have any questions about this product by Rosette, contact us by completing and submitting the form below. If you are looking for a specif part number, please include it with your message.